The McAvoy Group, one of the UK’s leading offsite construction specialists, has appointed David Clark as Manufacturing Director. David joined McAvoy in 2012 and now takes overall responsibility for offsite manufacturing across the Group. In his new role he will manage the expansion of production capacity to meet the business’s strategic growth plans. He will be driving productivity improvements across the manufacturing process, embedding both automation and digital solutions where possible. David will also ensure McAvoy retains flexibility in its production systems to deliver a wide range of offsite solutions, including permanent, bespoke modular buildings for hospitals, schools and commercial applications; offsite housing for rent and market sale, and interim facilities to meet short-term customer needs. In his previous role as Head of Manufacturing and Innovation, David led the Group’s pioneering and industry-leading work in applying digital technology to offsite construction. The Group’s use of BIM, digital scanning, tablets to collect data on site and other technologies such as virtual reality which enhances customer engagement have recently been recognised with the award of BIM Contractor of the Year to McAvoy at the BIM Awards. David is a high-profile conference speaker on digital construction and has over 20 years’ experience in manufacturing for the construction sector. 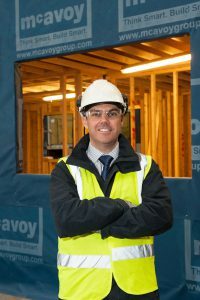 He holds an MSc in BIM and Project Management from Queen’s University Belfast and is actively involved in a number of industry bodies such as Buildoffsite and the Offsite Management School which aims to improve the design and offsite construction of new buildings. The McAvoy Group has two purpose-built manufacturing centres spanning more than 150,000sqft. It is an independent, family-owned business and an established principal contractor. The Group has been providing bespoke offsite solutions and interim modular buildings for nearly 50 years. McAvoy delivers fast-track building projects of the highest quality, more efficiently and in up to half the time for the healthcare, education, commercial, infrastructure and residential sectors.